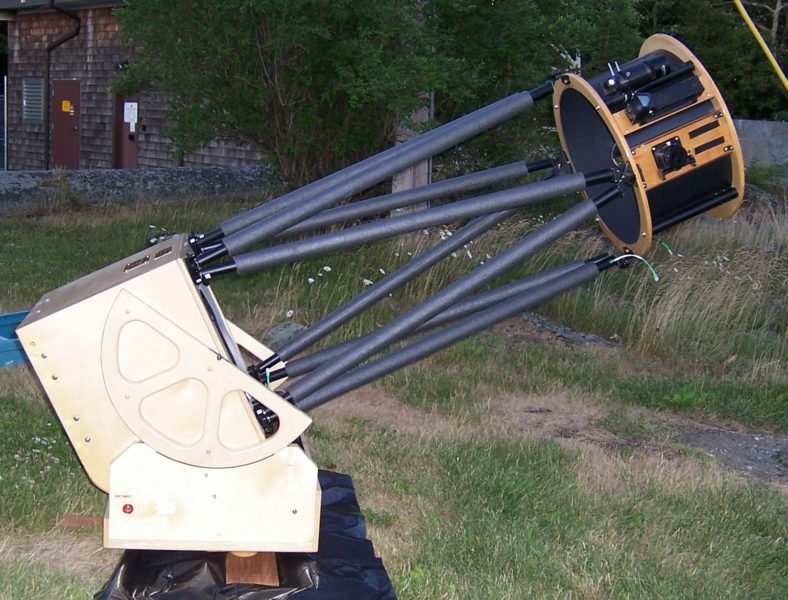 Shown above is the RAD, a 17.5″ Dobsonian designed and built by ASGH members. This telescope will sometimes be present at Van Vleck Observatory. It provides more detail in views of deep-sky objects than other member’s scopes, due to it’s larger aperture and excellent optics. RAD is an acronym of the initials of the club members who designed and built the telescope; Ralph, Al, and Dave. It’s easily disassembled into separate components for transport, and then reassembled while maintaining precise alignment of the optical components. The optical design makes it a Newtonian reflecting telescope, “Dobsonian” refers to the mounting. It’s named after John Dobson, an amateur astronomer who developed and made this type of mounting popular. There is no motor drive, but it moves easily with just the right amount of friction (fingertip pressure) in altitude and azimuth to compensate for the Earth’s rotation.